Wednesday included orientation for all new Harvard Ed School students. Rather than commentary, which I’m sure will work its way in here eventually, I thought I’d blast out some of the demographics shared with us by Associate Dean for Enrollment and Student Services Mohan Boodram. Avg. work experience: 5 yrs. Those were the pieces formally reported to and compiled by the admissions office. As part of an introductory seminar on multiculturalism, clickers were handed out and we self-reported on our demos. Across the United States, 27.2% of people have a bachelor’s. The whole process was fascinating. I’m still working out what it means (if anything) to be a part of this specific mix of people. Average work experience: 4.6 yrs. What are the implications of all of this? Does it help me understand anything that’s about to happen in the next 9 months, or does it give me a false sense of understanding the people with whom I’ll be studying? I don’t need to pay a therapist to give me crap. I have a roommate who does it for free. I used to not think you needed to meet the person with whom you would be living before you actually started, you know, living with them. That was the capricious attitude with which I threw myself into the process of finding a place to live in Cambridge next fall. I told those who asked what I was looking for that I didn’t mind. I’d take a room in someone’s attic with a naked mattress on the floor so long as the price was good. As I began sending out CraigsList inquiries, I was frustrated with their replies. People were charmed by my e-mails, thought I sounded great, and wanted to know when I would be able to come by and see the place. I replied that I was still teaching in Philadelphia and wouldn’t be able to get away to meet people. I assured my possible roommates that it wouldn’t matter. I threw “easygoing” and “laid back” around like product placement. 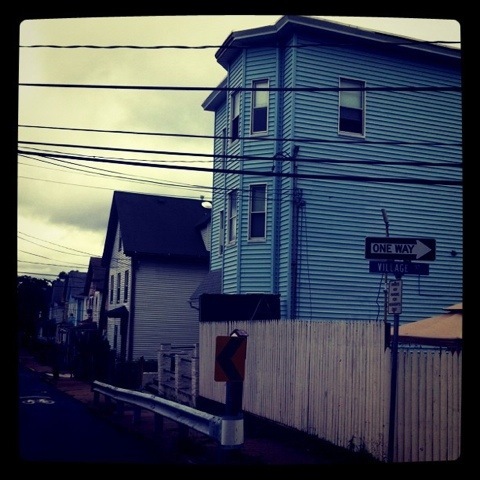 More interested in securing a place to live than proving the point that one need not know me to love me, I boarded a bus to Boston Friday to see some houses and meet some potential roommates. I’d three potentials on my list and scheduled times for each of the three. The first was a 5-bedroom home rented by the owner who would also be one of my roommates. As luck would have it, Meredith Stewart also arrived in Boston Friday. When we met for brunch Saturday morning, I asked if she’d come along to see one or more of the places with me. We made our way to the first possibility together, showing up a record 10 minutes early as the owner was pulling into the driveway. To say that the man was taciturn would be understating the matter. A robotic engineer and craft brew buff, he gave me more than enough information to work with to build a bond. We sat in the living room to get to know one another and I continued working my damnedest to get the man to smile. I’d been working my not inconsequentially gregarious skills for about 15 minutes without so much as a rise in the corner of his mouth, and now he was greenlighting my move-in. And that’s where we stood. He threw out the idea that I should look him up once I moved to town to see if there was still a room available, reiterating the idea that I was a good fit. I accepted the offer with the appropriate amount of graciousness. “It was like watching a horrible first date,” she said. Sitting there, grasping for conversation, attempting to ingratiate myself to this guy, felt just like every bad date I’d ever been on – only I didn’t get a meal. The awkwardness of the entire experience was brought into starker relief when I sat down with the roommates of my second house. A graduate from the program I’ll be entering and a Ph.D. student in South American literature, both were wonderful. We talked for nearly an hour and a half, wrapping our way through conversations on ed policy, the relative merits of True Blood and what kind of cooking lessons I might be able to provide. Then and there, these two said they’d be willing to live with me and I accepted. The rent for the second place is a bit higher than the rent of the first. On paper alone, I would likely have gone with the first. My next year would have been one of being holed up in my room having awkward conversations in the shared spaces and killing myself to get that guy to laugh. Instead, I’ll pay a little more, be a ton closer and live with people whose company I seem to genuinely enjoy. I’ll run the risk of giving Malcolm Gladwell a big head and admit to knowing the outcome of both meetings within the first few seconds. I’ll also admit to learning the value of meeting those potential roommates face-to-face. Mid-March, I found out I was accepted to the Harvard Ed School’s master’s program in Ed Policy and Management. Toward the end of March, I had an idea for helping to overcome what appeared to be the largest hurdle to actually attending the program – paying for it. While the idea didn’t make up the difference, it did subsidize approximately 11 percent of what I needed to attend. As it became clear my audacious goal was just that, I started to become as knowledgeable as I’ve ever been about student loans. Somewhere in there were more frequent phone calls home than I’ve probably ever made since moving out. I’m going to Harvard in the Fall. I’ll be honoring my commitment to those who graciously donated to Chasing Harvard. I’ll also be proud owner of some substantial student loans. A great deal of my decision was made when I attended the open house for newly admitted students. Admittedly, I was (and still am) cautious about some of the rhetoric coming out of the school. I was worried I’d have no one with whom I would connect, that SLA and schools like it would be an impossibility in the minds of people I met. I did meet and hear from some people with whom I adamantly disagreed. I also met and heard from people who thought deeply and passionately about many of the same ideas I hold dear. That is the kind of environment in which I want to learn. I’ve always sought a plurality of ideas. My most invigorating conversations are those with people who will argue against me just as ardently as I argue against them while both of us are seeking to understand. I am not so naive as to believe I’ll be entering some sort of modern Lyceum. All I hope for is a program of study where my ideas will be challenged and where I am free to challenge the ideas of those around me. I’ve found that. Also key to my decision is the ability to cross-register in the Kennedy School of Government, Harvard Business School, Harvard School of Public Health, Harvard Law School – you get the idea. While I realize I’ll be limited to the number of outside course I’ll be able to take, I want a program that allows me to blend my learning about education’s ecosystem with learning about other intellectual ecosystems. As those systems interact and blend more and more, I want to study and understand those interactions. What scares me, what I don’t want, is to leave SLA. I’m sure I’ll write later about what I’ve learned and what it means to leave. This is about where I’m going, not where I’ve been. Let me just say that it is a testament to the people I learn alongside every day how difficult it will be to leave. In the end, I turned to Samuel Johnson’s thinking in “Rasselas.” Trying to understand happiness and how to acquire it, Johnson’s protagonist learns reaching for one thing means giving up another. In the end, one must make a choice and be content. I was accepted to the Harvard Graduate School of Education Master’s program in Education Policy and Management. I found out today I didn’t receive the merit scholarships from Harvard. While I’m willing to take out student loans to make this program a reality, there’s only so much money I’m approved to borrow. With an estimated $60K price tag, this makes things difficult. I’ve come up with an idea, and I’m asking for your help. Will you invest in me? The kind of transparency that shows not only what is happening, but also what is possible. I believe in the value of education. I believe the value of any education can be increased by dialogue and transparency. I believe there’s value to be had in the discussion of a transparent education. The connections made in the pursuit of this discussion are the value. The discussion has happened and will continue happen, but the experience of transparent education and the network of people that gather around this experience will exponentially increase the value. It is the sustained part of the discussion that will make this important. It isn’t one paper. It isn’t one blog post. It isn’t one Personal Learning Network (PLN) project. It is the ongoing experience of learning in an transparent way. Finding a way to make the value grow because there are more people learning together is worthwhile work. The traditional view of higher education has the student leaving the community to study in an cloister of learning, only to reappear upon graduation, degree in hand, ready to move to whatever’s next. With this project, I will bring the community along with me, invest the community in the process and build an archive of a transparent, dialog-driven education.For all the discussion of higher education, no true, public archive exists of the university experience, let alone an archive built in the public as the experience happens. Not only will this project generate discussion, debate and study of the graduate process, it will serve as an artifact of that process as it currently exists. I want my graduate experience to be a conversation and a text that builds itself. I will blog about my studies every single day. Every paper and project will be shared online (and built online whenever possible) and Creative Commons-licensed. As a function of the blog, the program of study will be posted publicly so that all backers will be able to view any class notes as they are drafted in Google Docs to later be posted as part of the archive. In every possible way, the experience will be public, transparent and built around the dialogue it generates. Funders will receive access to the project blog as well as be guaranteed one public thank you throughout the course of the program. Starting at $40, backers for this project will receive live access to all course notes as they are drafted when available, a weekly multimedia e-mail blast documenting the social highlights of the course of study including music, films, books and television shows. From $80 and up, backers will also be invited to monthly online chats to discuss the program status, content and any issues of relevance. Should the archive be published in book form, all backers will be thanked within the text. A donation of $40 or more. Blog, tweet, e-mail, text and share this project with everyone you know and tell them to do the same. If all of this proves impossible and I am not able to attend Harvard, any collected funds will be donated to Science Leadership Academy. Two days ago, I got an e-mail telling me my decision was available online. Forty-five slow-motion seconds later, I was congratulated that I’d been accepted into Harvard University’s Graduate School of Education to study for a Master of Education in Education Policy and Management. Three miles later, I’d set a new personal best for the mile and my head was still swimming. I called my mom and told her the news while my sister Rachel who’s in town for her spring break was standing in front of me. They yelled in unison. Rachel hugged me. In the past 48 hours, I’ve completed my taxes, my first FAFSA (I worked through undergrad), and sent my financial aid application. Today, I told our advisory the news and stressed that nothing was sure. I want this – intensely. Still, for now, I got in to Harvard.